New book, 156 pages. If you do not own a milling machine (and even if you do) what you can achieve in your workshop is greatly enhanced if you own a spindle or two for use with your lathe. Spindles come in many shapes and sizes, ranging from 19mm (0.75 in) to 57 mm (2.25 in) in diameter, depending on the uses envisaged for them. 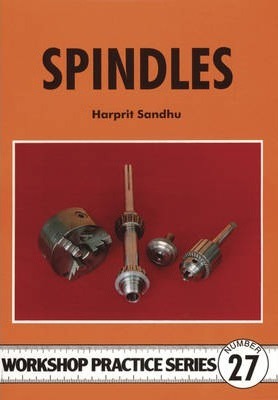 This book describes the design, construction and use of a variety of spindles that will be of interest to the amateur engineer. Milling, grinding and drilling spindles are covered along with a unique light gear-cutting frame for clockmakers. The emphasis is on spindles that are easy to make and have as few parts as possible; all but one for example use sealed ball bearings (the exception uses tapered collar bearings and thus needs to have seals installed to protect the bearings.) The basic spindle described uses the same spindle nose as the Myford Super 7 lathe; this allows all chucks, plates, collets and closers designed for the lathe to be used with this spindle. It can also be modified for other lathe nose standards. Harprit Singh Sandhu, BSME, MSCerE, is an American engineer and the founder of Rhino Robots Inc., where he was the chief designer of the ‘Rhino’ series of robots. In his spare time he is a journeyman designer, machinist & woodworker, whose interest in clock making led him to design & build the spindles described in the book. Contents: Designing a Spindle; The Basic Spindle; Mounting a Spindle; A Smaller No.2 Morse Taper Spindle; Micro Spindle; 1 inch (25mm) Diameter Spindle; 1.25 inch (32mm) Diameter Spindle; Light, Tool-Post OD Grinding Spindle; Simple, No.1 Morse Taper Spindle; Vertical Spindle or Gear Cutting Frame; Spindle With Tapered Roller Bearings; Driving the Spindles; Notes on Using Spindles; Ancillary Information; SI Drawings; UK Equivalent Tables.